These are considered to be among the most familiar of all chart patterns and often signal turning points, or reversals. The double top resembles the letter “M”. 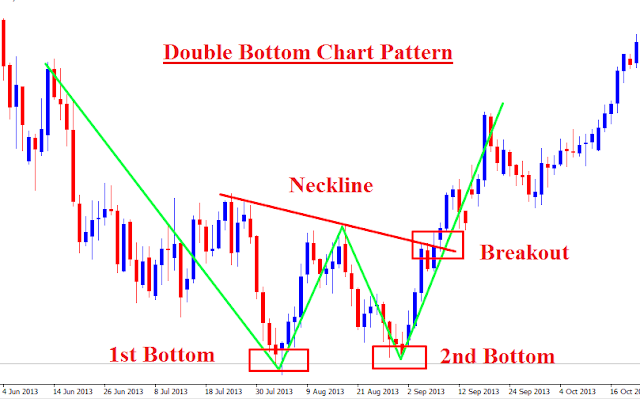 Conversely, the double bottom resembles a “W” formation; in reverse of the double top. 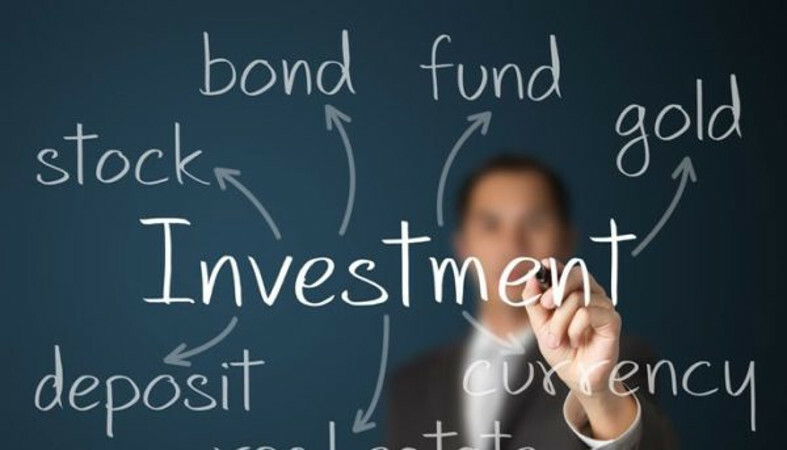 It is a term used in technical analysis to describe the rise of a stock, a drop and another rise roughly of the same level as the previous top and finally followed by another drop. 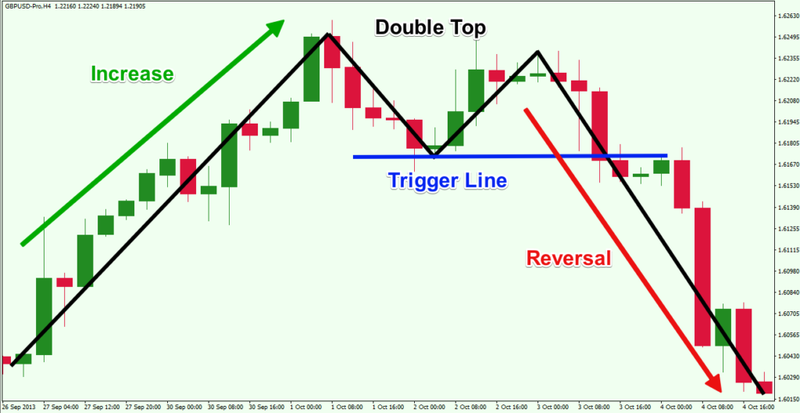 A double top is a reversal pattern which occurs following an extended uptrend. This name is given to the pair of peaks which is formed when price is unable to reach a new high. It is desirable to sell when the price breaks below the reaction low that is formed between the two peaks. 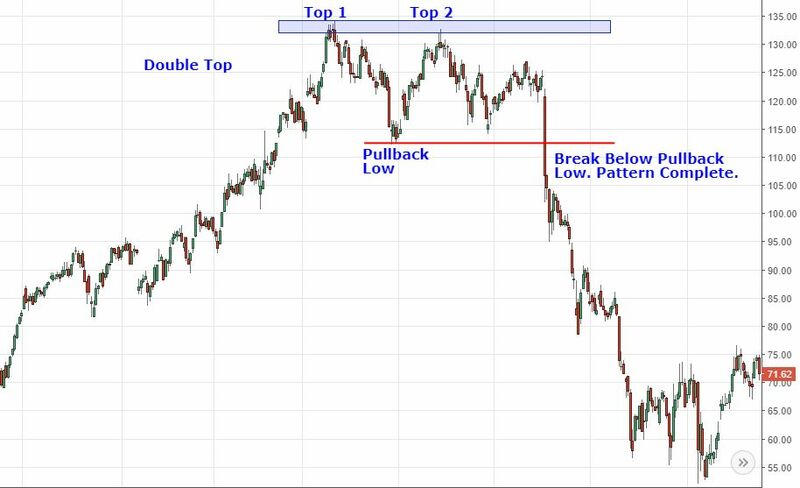 The double top must be followed by an extended price rise or uptrend. The two peaks formed need not be equal in price, but should be same in the area with a minor reaction low between them. This is a reliable indicator of a potential reversal to the downside. Price moves higher and forms a new high. This is followed by a downside retracement, which forms a reaction low before one final low-volume assault is made on the area of the recent high. In some cases the previous high is never reached, and sometimes it is briefly but does not hold. This pattern is said to be complete once price makes the second peak and then penetrates the lowest point between the highs, called the reaction low. 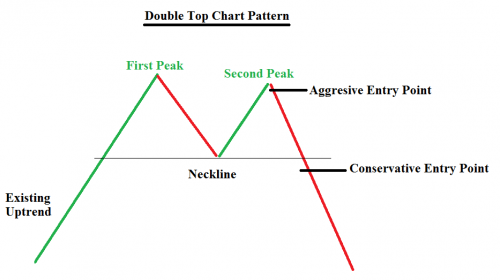 The sell indication from this topping pattern occurs when price breaks the reaction low to the downside. When the reaction low is penetrated to the downside, accompanied by expanding volume the double top pattern becomes official. Downside price target is calculated by subtracting the distance from the reaction low to the peak from the reaction low. 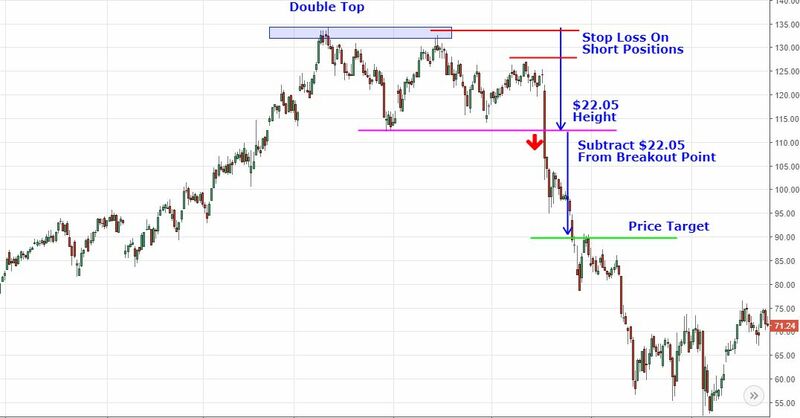 Often times a double top will mark a lasting top and lead to a significant decline which exceeds the price target to the downside. Although there can be variations but if the trend is from bullish to bearish, the classic double top will mark at least an intermediate change, if not long-term change. Many potential double tops can form along the way up, but until key support is broken, a reversal cannot be confirmed. Let’s look at the key points in the formation. With any reversal pattern, there must be an existing trend to reverse. In the case of the double top, a significant uptrend of several months should be in place. First peak: The first peak marks the highest point of the current trend. 10-20%. 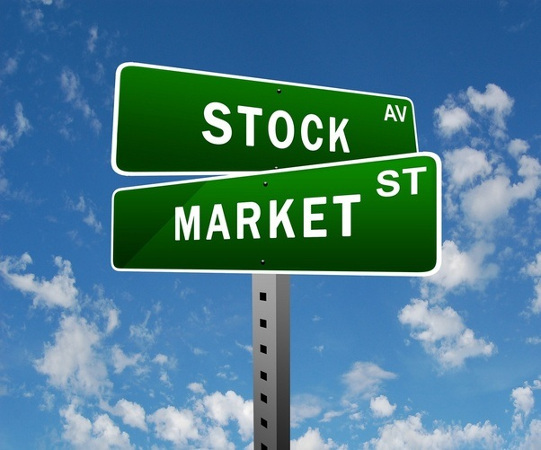 The lows are sometimes rounded or drawn out a bit, which can be a sign of tepid demand. The advance off the lows usually occurs with low volume and meets resistance from the previous high. Resistance from the previous high should be expected and after the resistance is met, only the possibility of a double top exists. The pattern still needs to be confirmed. The time period between peaks can vary from a few weeks to many months, with the norm being 1-3 months. While exact peaks are preferable, there is some leeway. Usually a peak within 3% of the previous high is adequate. Decline in the second peak is witnessed by an expanding volume and/or an accelerated descent, perhaps marked with a gap or two. Such a decline shows that the forces of supply are stronger than the forces of demand and a support test is imminent. The double top and trend reversal are not complete even when the trading till the support is done. The double top pattern is said to be complete when the support breaks from the lowest point between the peaks. This too should occur with an increase in volume and/or an accelerated descent. Broken support becomes potential resistance and there is sometimes a test of this newfound resistance level with a reaction rally. 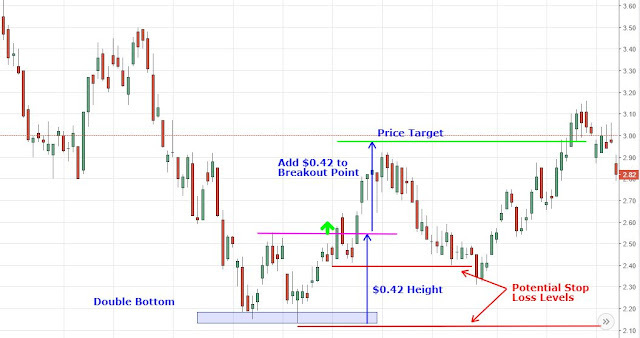 Price target is calculated by subtracting the distance from the support break to peak from the support break. The larger the potential decline the bigger will be the formation. * This stock formed a double top after a big price advance. But it fails to breach the resistance and results in price falls. * Technicians should take proper steps to avoid deceptive double tops. The peaks should be separated by a time period of at least a month. If the peaks are too close, they could just represent normal resistance rather than a lasting change in the supply/demand picture. Ensure that the low between the peaks declines at least 10%. Declines less than 10% may not be indicative of a significant increase in selling pressure. After the decline, analyze the trough for clues on the strength of demand. If the trough drags on a bi and has trouble moving back up, demand could be drying up. When the security does advance, look for a contraction in volume as a further indication of weakening demand. * The most important aspect of a double top is to avoid jumping the gun. The support should be broken in a convincing manner and with an expansion of volume. A price or time filter can be applied to differentiate between valid and false support breaks. A price filter might require a 3% support break before validation. A time filter might require the support break to hold for 3 days before considering it valid. The trend is in force until proven otherwise. This applies to the double top as well. Until support is broken in a convincing manner, the trend remains up. which is formed between the two lows. The double bottom must be followed by an extended decline in prices. The two lows formed have to be equal in areas with a minor reaction high between them, though they need not to be equal in price. This is a reliable indicator of a potential reversal to the upside. Price reduces further to form a new low. This is followed by upside retracement or minor bounce, which forms a reaction high before one final low-volume downward push is made to the area of the recent low. In some cases the previous low is never reached, while in others it is briefly penetrated to the downside, but price does not remain below it. This pattern is considered complete once price makes the second low and then penetrates the highest point between the lows, called the reaction high. The buy indication from this bottom pattern occurs when price breaks the reaction high to the upside. calculated adding the distance from the reaction high to the low to that of reaction high. Often times a double bottom will mark a lasting low and lead to a significant price advance which exceeds the price target to the upside. With any reversal pattern, there must be an existing trend to reverse. In the case of the double bottom, a significant downtrend of several months should be in place. It marks the lowest point of the current trend. Though it is fairly normal in appearance and the downtrend remains firmly in place. place. An increase in the volume from the first trough signals an early accumulation. The peaks high is sometimes rounded or drawn out a bit because of the hesitation in going back. This hesitation is an indication of an increase in demand, but this increase is not strong enough for a breakout. The decline off the reaction high usually occurs with low volume and meets support from the previous low. Support from the previous low should be expected. Even after establishing support, only the possibility of a double bottom exists, it still needs to be confirmed. The time period between troughs can vary from a few weeks to many months, with the norm being 1-3 months. While exact troughs are preferable, there is some room to maneuver and usually a trough within 3% of the previous is considered valid. volume and buying pressure. An accelerated ascent, perhaps marked with a gap or two, also indicates a potential change in sentiment. troughs completes the double bottom. This too should occur with an increase in volume and/ or an accelerated ascent. Broken resistance becomes potential support and there is sometimes a test of this newfound support level with the first correction. 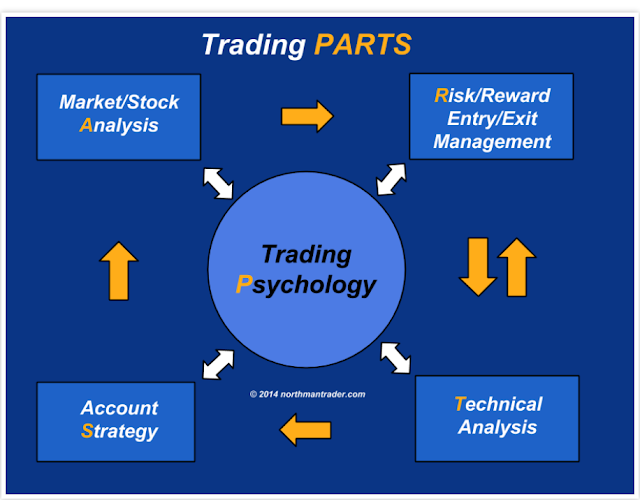 Such a test can offer a second chance to close a short position or initiate a long. Target is estimated by adding the distance from the resistance breakout to trough lows on top of the resistance break. This would imply that the bigger the formation is, the larger the potential advance. 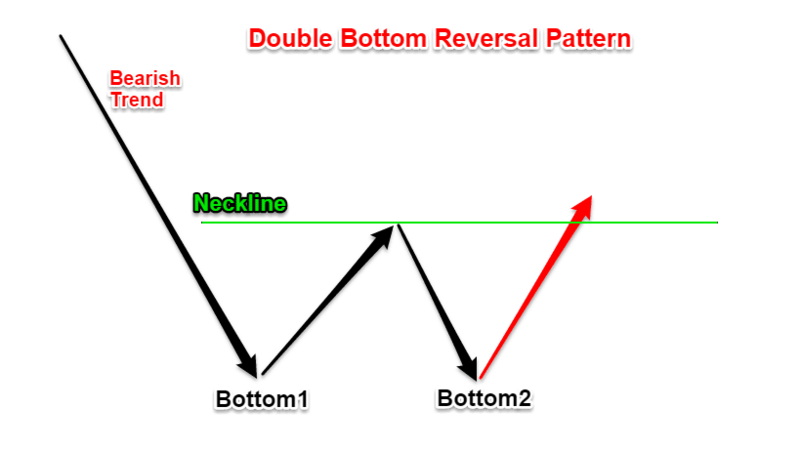 * The double bottom is an intermediate to long-term reversal pattern that will not form in a few days. Though it can be formed in a time span of few weeks, but it is preferable to have at least a time of 4 weeks between the two lows. Bottoms usually take more time than the top. This pattern should be given proper time to develop. * The advance off of the first trough should be 10-20%. The second trough should form a low within 3% of the previous low and volume on the ensuing advance should increase. Signs of buying pressure can be checked by the volume indicators such as Chaikin Money Flow, OBV and Accumulation/Distribution. The formation is not complete until the previous reaction high is taken out. 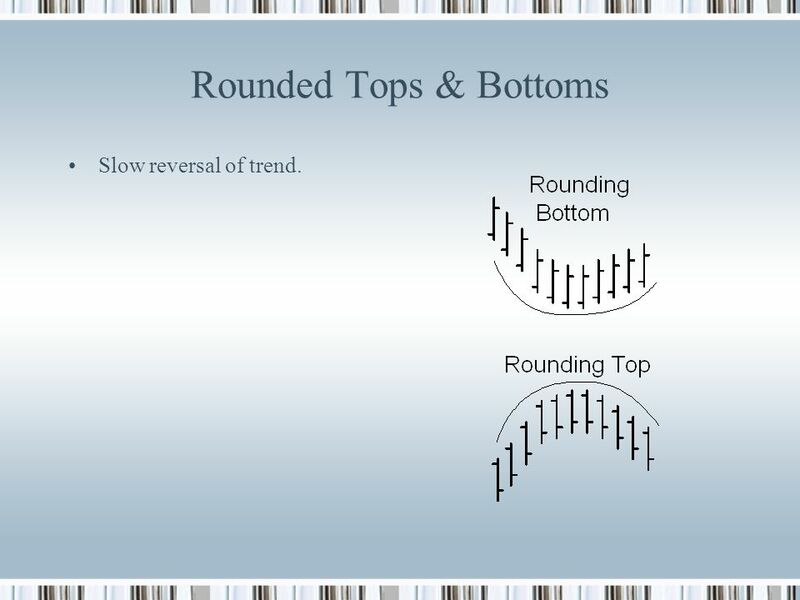 Another shape which a top and bottom can take is one in which the reversal is “rounded”. 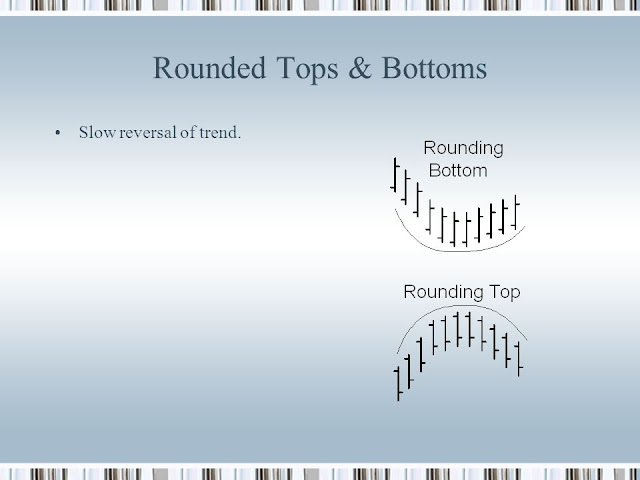 The rounded bottom formation forms when the market gradually yet steadily shifts from a bearish to bullish outlook while in the case of a rounded top, from bullish to bearish. The Rounded Top formation consists of a gradual change in trend from up to down. The Rounded Bottom formation consists of a gradual change in trend from down to up. This formation is the exact opposite of a Rounded Top Formation. The prices take on a bowl shaped pattern as the market slowly and casually changes from an upward to a downward trend It is very (remove) considered very difficult to separate a rounded bottom, where the price continues to decrease from a consolidation pattern and where price stays at a level, but the clue, as always, is in volume. In a true Rounded Bottom, the volume decreases as the price decreases, this signifies a decrease in the selling pressure. 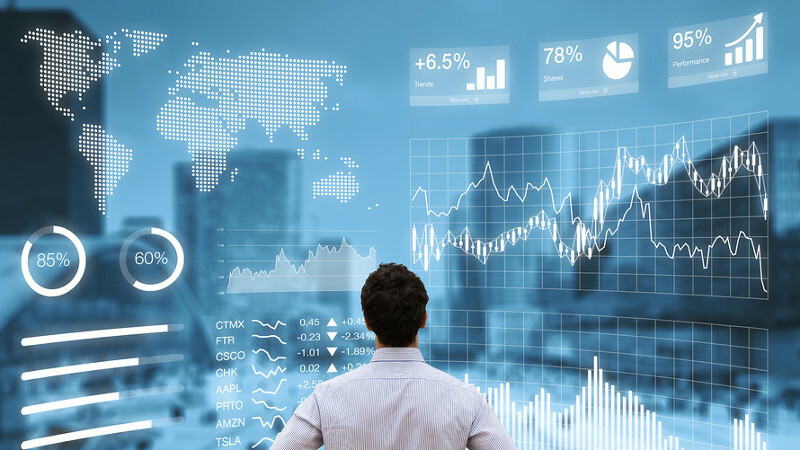 A very little trading activity can be seen when the price movement becomes neutral and goes sideways and the volumes are also low. Then, as prices start to increase, the volume increases.